I had a couple days off last week so one of my primary goals was to get the girls to the vet for their check ups. It's so nice to have cats that are healthy and don't require a weekly vet visit. They are still quite active and playful and not exhibiting signs of old age, unlike their human companion. Mija was first. I have to take her first because she will do a very, very good job of hiding if I take Pilchard first. They know the carrier and all I have to do is get it out of the closet and they scatter. Pilchard took off to the basement once I put Mija in the carrier. 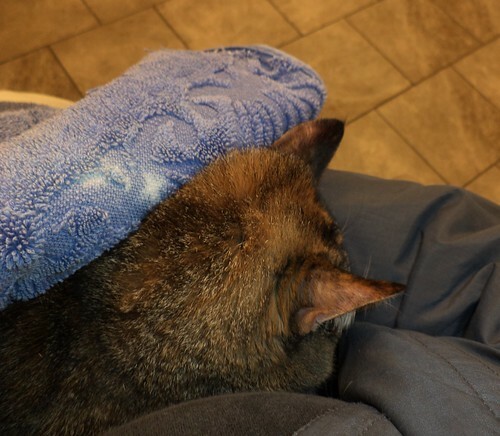 Had I decided to put their appointments back-to-back, as I used to do when I wasn't working, I'd have had to cancel Pilchard's because I wouldn't have been able to find her. It's so important to take the girls in. 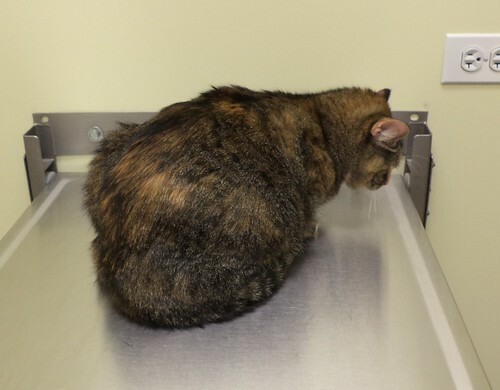 They have been a bit overweight for a few years now and that causes problems in pets as much as it causes problems in humans. Hence, part of the change in my lifestyle has also been to change what they are eating, incorporating more protein, meaning better food, and learning to read nutrition labels on cat food. I thought cat food was cat food, but it is not. I wish she would cuddle like this at home. Mija has dropped 0.2 of a pound. She wasn't the really chunky one, but she's my mooch. I need to cut back on deli turkey and the cat treats when I leave for and when I come home from work. I also need to get them more active. That's tough to do when I'm not that active myself. Mija also is in need of dental work, but I have another expense I have to take care of before I can think of doing that. Otherwise, she's in great health. Pilchard went the next day. I need to invest in a top loading cat carrier. The green one I have, which replaces the cream colored one I used for 20-odd years and which has the broken door hinge, is problematic for loading a cat like Pilchard. Mija can be shoved into it. Pilchard must be wrestled in. A top loading carrier, and there are some very nice ones out there, would make this necessary chore one step easier. 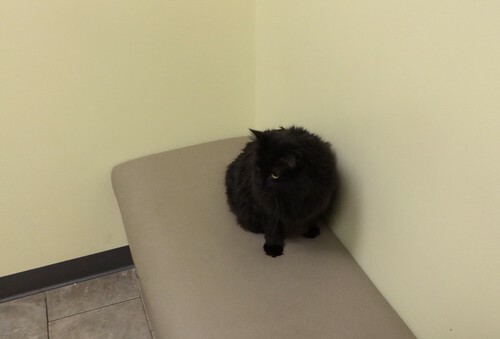 Knowing she had to go to the vet, I had given her a thorough combing right after breakfast, a good 2 hours before the appointment. I dump her out of the carrier and she looks like a street urchin or, worse, a cat without a forever home. 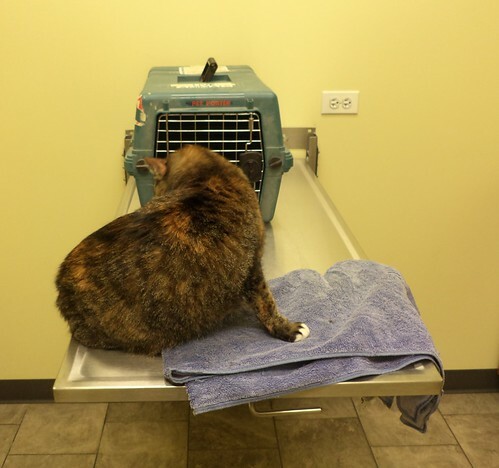 Her fur was dull and her dandruff, something the change in diet seemed to eliminate, was all over. You can sort of see the white flecks above. Doctor Zollinger just laughed. "I see this all the time. The stress of being in a carrier and then an unfamiliar place with unfamiliar smells just makes their coat look terrible. By evening, you'll never know she was here." Sure enough. She looked her old shiny, glossy self again by the evening lap time. Miss diva has always been something of a chunk. I thought this year she felt lighter. It was easier to scoop her up and cuddle her, but I attributed it to feeling better myself and more strength in my arms. Well, it's probably that, too, but she's lost a whole pound. 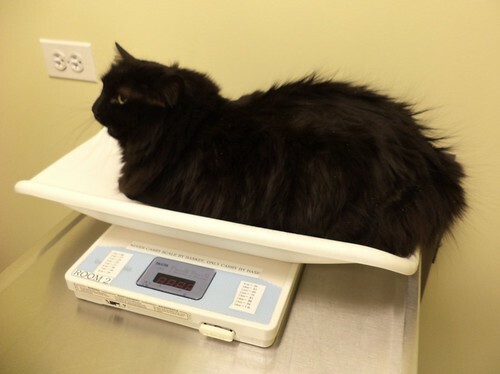 The combination of fewer treats, better quality food and a bit more exercise has helped her lose a whole pound. We need to keep that going. She didn't have dental issues, thankfully, so it's just Mija who needs to go in. Now we are set for another year. They have their rabies shots. Both are 8 years old and I need to have a senior cat blood work panel done on them. I know this whole set of health issues. HRH could only be mad at me for an hour after coming home. I had to head off to get the car an oil change and to see my doctor so they were left alone for the afternoon. 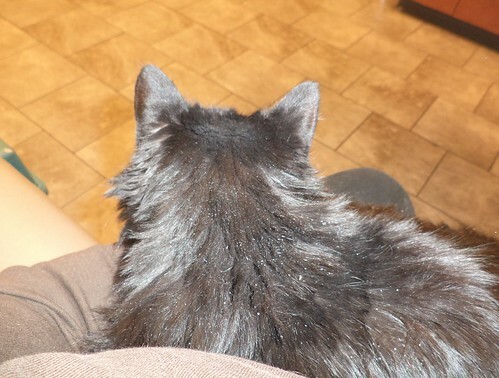 When I got home from the grocery and put away the food, both were happy when I sat down in the recliner and put up my feet. Pilchard took over my lap and Mija cuddled next to me. That whole invasion of our dignity is forgiven.